Cathay Pacific also use the 777-300 for their shorthaul Hong Kong to Manila routes but I also believe they use the airbus a330 and new airbus a350. However unlike their longhaul route which incorporates a 4 class cabin, their shorthaul (or this specific flight)only use a 3 class cabin as there is no first class tier or have never seen it in this specific flight. Hong Kong to Manila is around an hour and a half in flight time. Cathay Pacific’s shorthaul economy seat on their 777-300 is the same as that of their longhaul economy products (from what I have experienced a few times) click here . The huge difference between Cathay Pacific’s longhaul and shorthaul is their meals which quiet understandably is reduced from 2 meals (LHR>HKG) into a quick snack bag. This small card bag contains a drink (sometimes water other times juices), a biscuit (usually Anzac cookie) and a pastry (many different flavours). The pastry in itself is very delicious and rightly warm, however although flavours of the pastry will change, if you are a frequent flyer with the airline this could get very boring. The cookie is standard and the drink inside the bag changes without a choice, the crew do not offer any other beverages and I am not too sure if you can request one either. The bag is nice and convenient, when you are done with your snacks you can put all your rubbish inside so it can be collected later. However if you like little souvenirs this small card bag is nice to keep. The premium economy seat in this route (shorthaul) is also the same product as their longhaul premium economy seat (click here). However the biggest surprise is that the meal or snack in this flight was exactly the same as their economy meal. The snack also included the same Anzac cookie, a drink and a pastry which all does the job for this short flight. The small bag the meal comes in is nice and for those souvenir lovers it is nice to keep, otherwise it is very convenient to use for your rubbish until it is collected. Other than the meals and the exclusion of a first class cabin, I didn’t see much of a difference from their longhaul flights than I have seen on other airlines. This is a good thing in opinion as it gives a seamless journey. Back to Main Cathay Pacific Review. Cathay Pacific usually use the Boeing 777-300 on their London Heathrow to Hong Kong route but I believe they are also using their new airbus a350. The aircraft incorporates a four tier cabin layout with six first class suites, fifty three flat bed business class, thirty four premium economy and one hundred and eighty two economy seats. I have only experienced and will write about their economy and premium economy tiers. London to Hong Kong is around eleven hours in flight time, so two appropriate meals are served depending on the time of flight including snacks such as pot noodles available upon request whenever you please. Cathay Pacific economy seats have thirty two inches in pitch and eighteen inches in width, it incorporates many of the standard amenities other airlines of similar standard embodies. The usual requirements of a table, seat pocket, personal light, air, armrest and entertainment system are built in. However the product that Cathay Pacific applies that I believe is overlooked by other airlines is the cup holder because if you only have a beverage there is no need to pull down the whole tray table giving more space to manoeuvre. Another aspect that I love in this seat is the long amenity holder just under the screen which can hold many of your personal belongings such as phones, tablets, books and many more. In my opinion this rack is more useful for your personal belongings than your seat pocket. A USB is also built in next to the screen which is another added bonus however the product I always believe is useless in any economy product is the coat hanger because it is used very little and if it is used it is usually not affective and will also affect your leg space. All their products seem very robust and I have never experienced a faulty one. In this specific eleven hour flight you are served two meals, one just after take-off and the other just before landing with cup noodles and beverages available upon request at anytime of the flight. The meals are not overly amazing but is delicious and does the job. You are given a choice which usually consist of a chicken, fish, beef with either rice, noodles, potatoes and others. A salad, bread, water bottle and bread will be on your tray already but sometimes your desert which is usually a small tub of Haagen Dazs ice cream is given after. I have to say the food is delicious however pretty small. Cathay Pacific’s premium economy product is similar to that of their main economy tier but with enhanced comfort. It is in a separate cabin in a 2-4-2 configuration. Firstly their seat have an added six inches in their seat pitch making it a total of 38 inches, the seat is also 1 inch wider than that of economy class making it a total of 19.5 inches. Premium economy gets an upgraded baggage allowance and upon entering the aircraft you are given an amenity kit and a welcome drink which you don’t receive on the main economy cabin. Noise cancelling headphones is given instead of the basic ones and blankets and pillows seem a bit larger. Majority of the products that are incorporated in economy are also applied in premium economy but with a few added items and characteristics. Firstly there is a footrest applied and a larger recline for added comfort. Furthermore a centre console between each seats is built for a more personal affect it is also used to incorporate a beverage holder in which there is also an extension if needed. The entertainment screen is 10 inches which is around 1 inch larger than that of the lower class and two charging methods with either a universal or USB socket. The meals were a little different from economy, firstly you were given a nice menu instead of a boring small card which is a nice touch. You are usually also offered three options, I believe the tray including the bread, salads and condiments is from economy but the main meal is taken from business, but don’t quote me on that because im not too sure. Cathay Pacific Hong Kong’s flag carrier and one of the members of the ‘Oneworld Alliance’. Cathay was founded in 1946 and was initially based in Shanghai however the two owners an American and Australian moved to Hong Kong where the airline was further established. It was said the that the owners though of the name ‘Cathay Pacific’ in the bar at ‘Manila Hotel’. To date (2018) Cathay Pacific has a strong fleet of 146 made of both Airbus and Boeing aircraft. I often use Cathay Pacific in some of my travels to the Philippines and back, this route stops over and changes in Hong Kong International airport as it is not direct, meaning two flights are taken each way. Apart from the flight duration and meals both journeys to Hong Kong and the Philippines have similarities, both routes usually use the 777-300 with identical products and services inflight. Hong Kong international airport terminal 1 is Cathay Pacific’s home and main hub. It is a massive structure where arrivals is situated in the ground floor whilst departures a few floors above. The airport incorporates isle type sections in the check-in desks and Cathay Pacific uses three of them (isles A-C from my memory). Cathay Pacific is one of my most favoured airline for longhaul flights to and from Asia as it gives desirable experiences for a relatively competitive price all year round. Furthermore the airline flies from London Heathrow to Hong Kong about five times a day, whilst Hong Kong to Manila six to seven times a day so your preference in departures, arrivals and transit times range from a multitude of choices. Moreover the airline has consistency in their products and services which is great for frequent travellers who just want confidence in their flight. 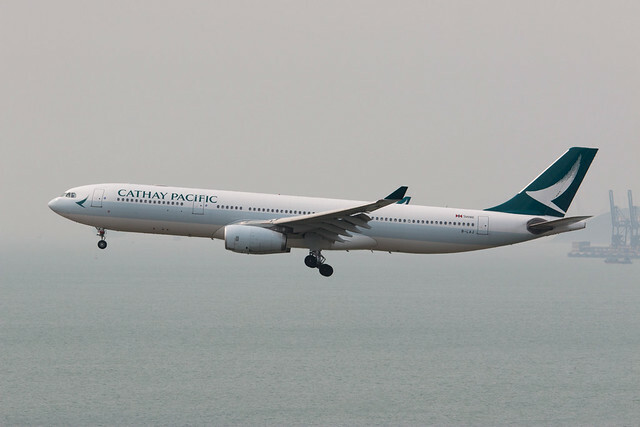 Cathay Pacific is a reputable airline worthy for a frequent flyer with a medium budget who wants to fly with the confidence in his or her flight, although not highly amazing their consistency in products and service is applaudable. Cathay Pacific is not my overall favourite airline but is my preferred carrier when travelling long-haul into Asia. Their seats are comfortable and gives me everything I need to ensure maximum comfortability. Whilst the meals small they were undeniably delicious and you can taste that they didn’t go cheap in their ingredients. Furthermore their staff are friendly and do their jobs to the very best of their ability, there are no loud personal conversations whilst in front of customers. Overall Cathay gets and has always got a thumbs up from me. A plausible airline that is affordable and brilliant in its operation.